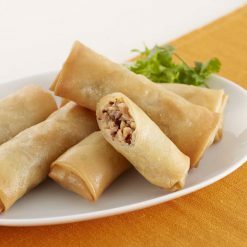 Authentic Chinese-style spring rolls that can be pan-fried on the stovetop. Product totals 250g (5 rolls, 50g each). 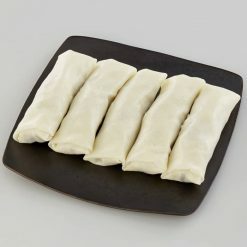 These Chinese-style spring rolls are made with lots of bamboo shoots, pork, wood ear mushroom, and dried shiitake mushroom, and encased in crispy wrappers. The former version of this item was for deep-frying only, but because we have changed the composition of the wrappers it can now also be pan-fried. Whether pan-fried or deep-fried, these rolls will come out crispy and crunchy. 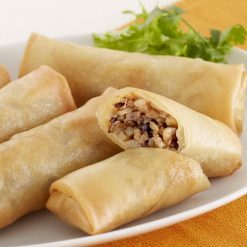 It can be hard to find the time to prepare foods such as spring rolls, especially if you do not live in an area that sells spring roll wraps. That’s why these rolls come completely ready to fry, with no need for washing and chopping the filling ingredients or cleanup afterward; making it easy for you to enjoy your favorite foods even on the busiest of days! To pan-fry on the stovetop: Place the spring rolls (still frozen) in a frying pan that has had a generous amount of oil applied to it. Pan-fry one side of the rolls for about 5 minutes on low heat until that side turns golden brown, then flip them over. Pan-fry the second side for about 5 minutes in the same manner, until it too turns golden brown.To deep-fry: Place the spring rolls in oil that has been heated to about 170℃ and fry for about 5 minutes. This product contains amboo shoots, pork, vegetable fats and oils (sesame oil, soybean oil), flavoring extract (chicken, yeast, gelatin, pork, wheat gluten, vegetables), dried wood ear mushroom, dried shiitake mushroom, fermented seasoning, rice starch, grated ginger, soy sauce, sugar, pepper), wrappers (wheat flour, starch syrup, soybean oil, corn flour, table salt, glucose/dextrose, powdered soy protein).. Origin of ingredients: bamboo shoots (domestic), pork (USA, domestic). Prepared and packaged in Japan.